Charlie Wheeler Band is a blue's rock trio out of Northern PA. Charlie Wheeler on lead vocals and guitar, self-wrote all the lyrics that tell stories of life, love, and "living life on the edge". Charlie and Dave Fink (Bass Guitar and Backing Vocals) deliver music that is energetic and engaging. Each song has its own style at times it can be funny, deep, light, or heavy. The songs are filled with tireless and lively guitar work that is to quote: "reckless, pent-up hostility." 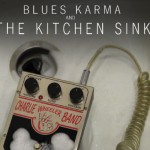 A few strong and compelling songs on the album, "Blues Karma and The Kitchen Sink" are "People Keep on Talkin'", "Flicker away", "Follow Me Down".